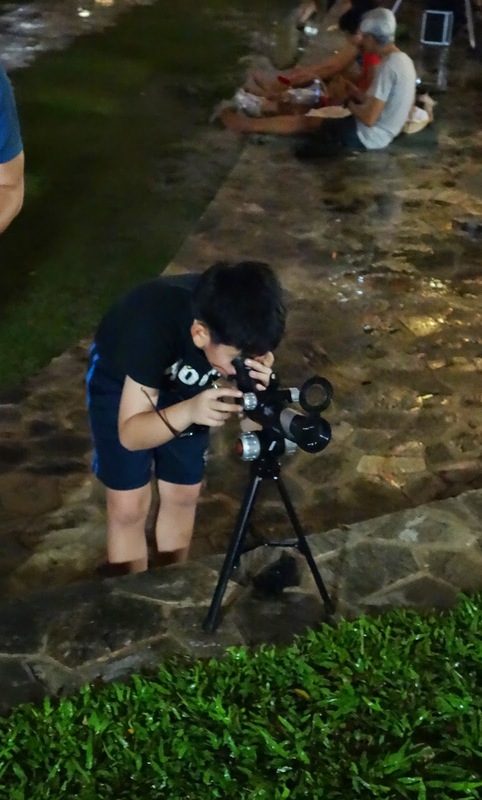 Weather permitting, Moon-gazing through telescope outside Courts Toa Payoh tonight 19 Dec 2015. From 8:15pm onwards. Come see the beautiful half-lit Moon magnified! Check my twitter for latest updates. Weather permitting, we will be conducting a stargazing session tonight 21 Nov at open grounds outside Bishan Park McDonald's from 7:30pm till late evening. We will be deploying our telescopes for the public to enjoy free of charge as usual. Bring your family and friends along and come see the Moon and stars through telescopes! Have a nice chat with us about the Universe we all live in. Check my tweets for the latest updates. Weather permitting, we will be stargazing at public open ground outside Bishan Park McDonald's tonight from 7:45pm. Join us if you are free. Come see the Moon (and hopefully stars too!) through a telescope. Don't take clear night skies for granted as the year end north-east monsoon is fast approaching. Weather and haze permitting, mid-autumn Moon-gazing through our telescopes at McDonald's Bishan Park tonight 19 Sept 2015. From 7:45pm onwards. Follow my Twitter for latest changes. Weather permitting, we will be observing Super Moon, stars and planet outside Bishan Park McDonald's tonight, Saturday 29 Aug 2015 from 7pm. Come join us and look through our telescopes. All are welcomed. Free of charge as it has always been. Wherever you are tonight, take a good look at the Moon and see if you find it bigger than other Full Moons! Weather permitting, Moon and stargazing through telescopes tonight, Sunday 23 Aug 2015. From 7:45pm. Outside Starbucks at Toa Payoh Hub (not library). Update 8:00 pm: No stargazing tonight. Cancelled due to bad weather. Update 6:47pm: Clouds rolling in. Event on hold. Will continue to monitor sky condition. Weather permitting, we will be conducting an impromptu stargazing session at open grounds outside Courts Toa Payoh tonight Saturday 25 July 2015. From 8pm. Come observe Moon, planets and stars through our telescopes! We will be conducting an impromptu stargazing session at open grounds outside Courts Toa Payoh tonight. From 8pm. Come look at Moon, planets and stars through our telescopes! Full frame colour photo of Pluto. In false colours. Pluto (left) and Charon. On 14 July 2015, at 7:49:59 PM Singapore time (11:49:59 UTC) NASA's New Horizons spacecraft will make its historic closest approach to the dwarf planet Pluto, the most distant solid object to be visited by a spacecraft. Credit: Video by YouTuber Michael500ca using Eyes on Pluto free simulation software. Weather permitting, free stargazing outside Bishan Park McDonald's tonight - Friday 29 May 2015. From 8:30pm till late night! 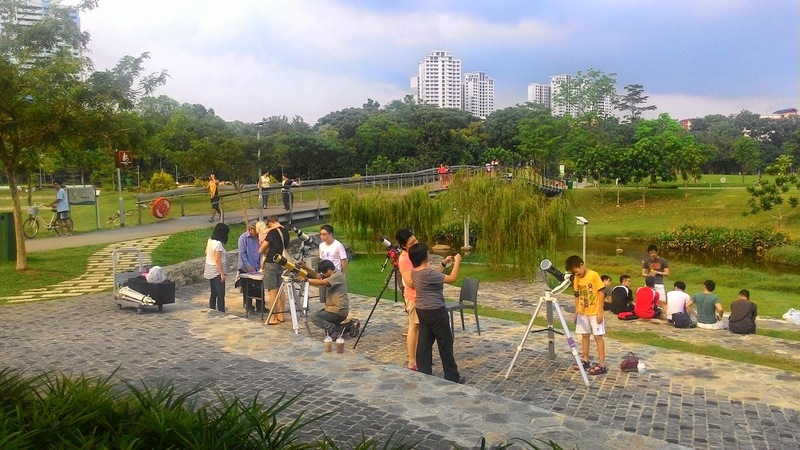 Free stargazing outside Bishan Park McDonald's today - Saturday 9 May 2015. From now (solar astronomy) till late night! Come see Sun, Jupiter, Saturn and star clusters thru telescopes! 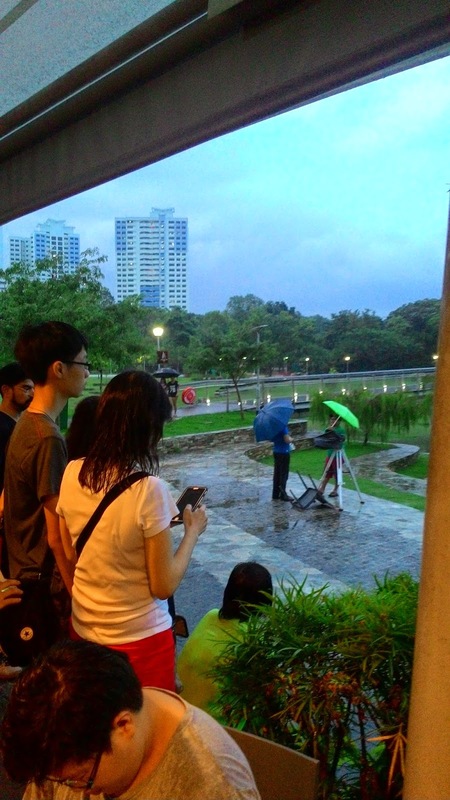 This is my report of the Total Lunar Eclipse event at Bishan Park on 4th April 2015 organised by Singapore Sidewalk Astronomy. - Solar astronomy session in the afternoon from 3pm. - Heavy rain at around 6:15pm. - Rain stopped at around 7:30pm. - Total eclipse "blood moon" phase not visible due to clouds. - Sky cleared up enough for Moon to be visible from 8:15pm. - Remaining umbra eclipse phase visible (duration: 1.5 hours). - Moon continues to be visible for a few more hours. - Public observed Moon with naked eyes, live on TV screen and through telescopes. - Public took photos and videos of Moon directly with cameras and handheld through telescopes. - Observing Jupiter through telescopes from about 10pm. - Sent some photos to Channel News Asia (CNA) for their news report that night. - Huge turnout despite poor weather in the early evening. Alfred and Dave conducted the solar astronomy session in the afternoon. Sun was playing hide and seek behind the clouds. They managed to capture some solar images and showed the public how the Sun looked like live through their solar telescopes. 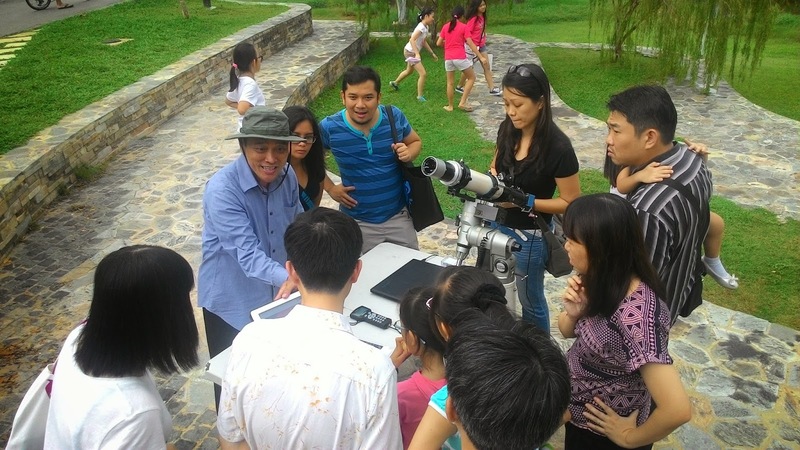 The crowd were enthralled by Alfred's clear explanation of various solar features and phenomenon, enhanced with printed photos and on a tablet screen. I was very impressed by the amazing solar images captured and processed by the young students in Alfred's school. 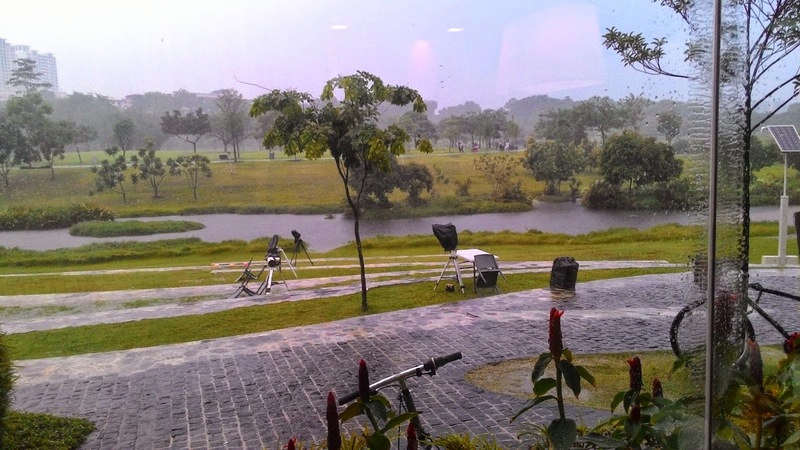 We were about to finish setting up our telescopes for the lunar eclipse at 6pm+ when a sudden light drizzle turned into a heavy rain! Thanks to Alfred for bringing trash bags along, our light buckets didn't turn into water buckets! Everyone dashed into McDonald's for shelter. We could have selfishly carry all our telescopes into the shelter obstructing human traffic and denying people of shelter space. But that's not the right thing to do. Dave and I wanted to further secure the trash bags over our telescopes with strings provided by Alfred. 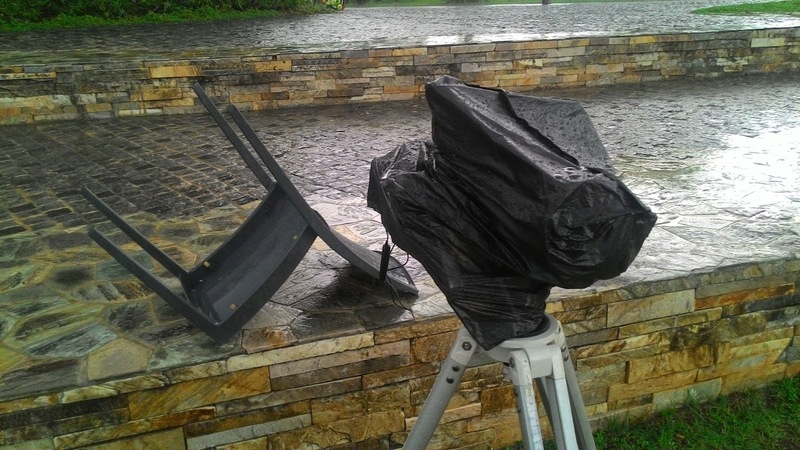 He went to his telescope and was struggling a little bit trying to hold a small umbrella between his neck and shoulder while trying to tie a string around the trash bag. Seeing a bro in trouble, there's only one thing left to do. Wearing my already wet hat, I walked towards him and helped him hold the umbrella to free up both his hands to do the tying. Needless to say, my shirt and pants were completely drenched. Then, the role reversed and I tied a string around the trash bag around my telescope. As to why my telescope was parked in a horizontal position instead of the typical upright position, it was because I only had time to make use of one trash bag during the sudden downpour (after making sure Haz get his trash bag before attending to my telescope), the focusing unit and eyepiece was at the front end and most importantly, there's a cooling fan unit attached at the other end of my telescope. In a typical straight up position, the strong wind would have easily brought rain water into the primary mirror from the sides of the telescope. Seek shelter from McDonald's again. Phone rang. Went into the quieter air-conditioned premise to answer the call from CNA. "Do you want this packet of tissue paper?" - a lady beside me said after seeing my drenched t-shirt sticking to my body. I was touched by the offer. Who says all Singaporeans are unkind? But still, I politely turned her down. It would take many boxes of tissue paper to dry me up. "Thank you! It's okay. I brought extra shirts.". The extra shirts were meant for a humid evening where I would be drenched in sweat during the event. No dry pants to change to. But at least later in the evening, I don't look like someone who fell into the Bishan Park river while looking at the Moon. The heavy rain turned into a light drizzle. Eclipse excitement was so high for this lady that she was chatting with Haz about astronomy under umbrellas! The rain finally stopped at around 7:45pm. Except for myself who was too busy multi-tasking, the rest of us went back to their telescopes and get them ready for eclipse viewing. The crowd came out of the shelter. More and more people from around the park started pouring in. It was still very cloudy after the rain. By 8pm it was quite obvious to me we will not see the short total eclipse phase where the Moon will turn red. Was feeling quite disappointed at that moment. Weeks of preparation, discussions, online and offline publicity, hours spent creating the eclipse video, interviews with Straits Times and convincing them to postponed the stargazing article to last Friday instead of the Friday before Earth Hour. All these efforts seems to have gone to waste. Was expecting the crowd to give up and leave the park soon. But most of them stayed and just kept looking at the eastern sky as if they are trying to use their eye powers to chase the clouds away. If they have not given up, why should I? So I decided to use the most portable public address system available at that moment - my voice. Spoke at a loud volume to the crowds what we are trying to observe and that we will still be able to catch the partially eclipsed Moon if it is visible before 9:44pm. We only have a couple of laptops and a huge crowd. Suddenly remembered almost everyone is using a smart phone with data plan in Singapore. That's when I quickly found a live streaming website (NASA on ustream) and announced its url address. 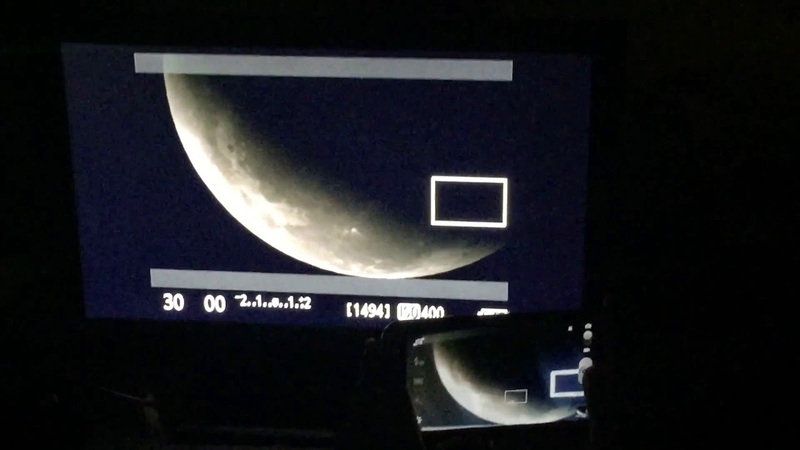 Everyone got to watch the live streaming on their phone while waiting for the sky to clear. Alfred also started streaming it on his laptop screen. At around 8:15pm, the Moon appeared! It started with a thin bright crescent and played hide and seek in the clouds for a few more minutes before appearing in its full glory! The crowd was electrified at the sighting! Many looks of relief and joy. They started taking photos, rushed to join the telescope queues and calling family and friends that they finally saw the eclipsed Moon! Finally, I can start manning my telescope and enjoy observing the Moon from about 9pm. Removed the trash bag and was glad the internal primary mirror unit was dry. This wide-field telescope was selected to take photos of Moon quickly via handheld photography over the eyepiece. With my other telescopes, I need to hold my hands and body extra still because of the narrower field of view. Tried to get as many people to observe the eclipsed Moon visually before I started taking requests to shoot it with their phones. It was quite a interesting sight through the telescope. 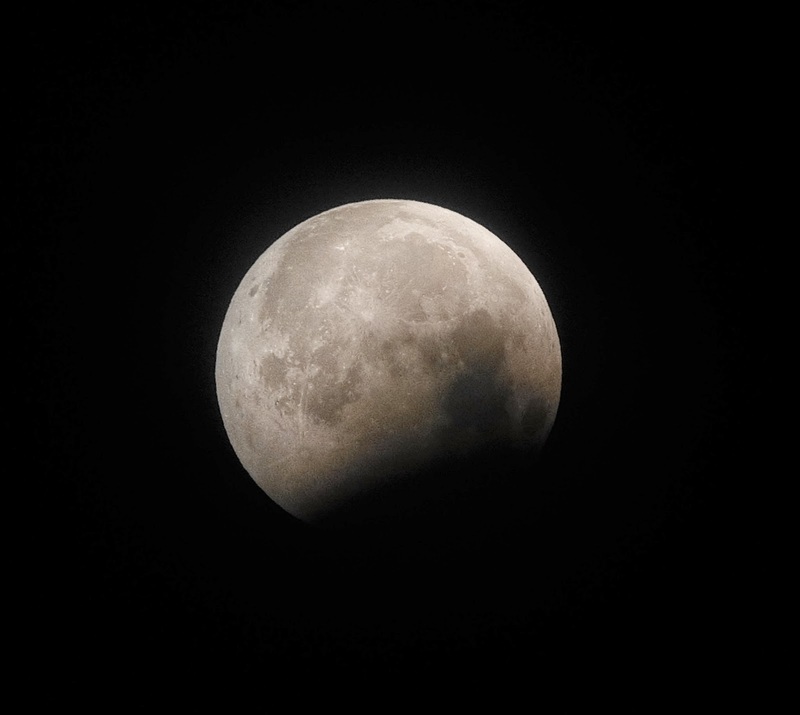 With naked eyes, the darkened areas of the eclipsed Moon looked featureless and opaque. This is the same result with most phone cameras. But observing through the telescope, our eyes can see an incredible dynamic range of light - most interestingly, the ability to also see the surface details of the Moon in the shadowed portion. The mobile phone through telescope shooting session was smooth and efficient. Point. Touch focus. Shutter click. Next! Too busy focusing on snapping good phone pics for everyone in the long queue and didn't really have time to observe the crowd's reaction. But from hearing the oohs, ahhs, wows and laughter in the park, I knew this lunar eclipse event will have a happy ending. Sure, seeing the greatest eclipse phase will be awesome. But being able to observe and photograph the partial eclipse phase for more than an hour is way better than not seeing the Moon at all. There was no burning-induced haze blanketing our skies like in last October's Total Lunar Eclipse. The heavy rain early in the evening washed away some of the smog in our urban city and made a supposedly hot and humid evening a cool and refreshing one. When the partial eclipse phase ended, most of our telescopes were pointed at Jupiter. As usual, the crowd was amazed that "star"in the sky is actually the biggest planet in our Solar System. It was a busy day for everyone. Most of us were so surrounded by people we could hardly observe what was happening at other telescope stations. I am sure the rest of the telescope volunteers and helpers have their own interesting stories to tell. If you meet them during our future sidewalk astronomy sessions, do ask them to share these stories with you. Thanks to Alfred for bringing down so much cool astronomical gear, conducting the day and night stargazing sessions. Ever so patient with the public young and old, humbly sharing your knowledge, you are an inspiration! Thanks to James for being so supportive of our Toa Payoh - Bishan events over the years despite staying at the far end of Singapore. Despite some injuries to your legs and against my advice to rest at home, you brought your heavy and bulky telescope setup + TV screen + tables and chairs. You gave the crowd an experience they will not forget for a long time. This is screenshot from the above-mentioned YouTube video. We delivered what we promised in national papers! Thanks to Ava for helping out at the various telescope stations and being an encouragement for other ladies interested in space and astronomy. 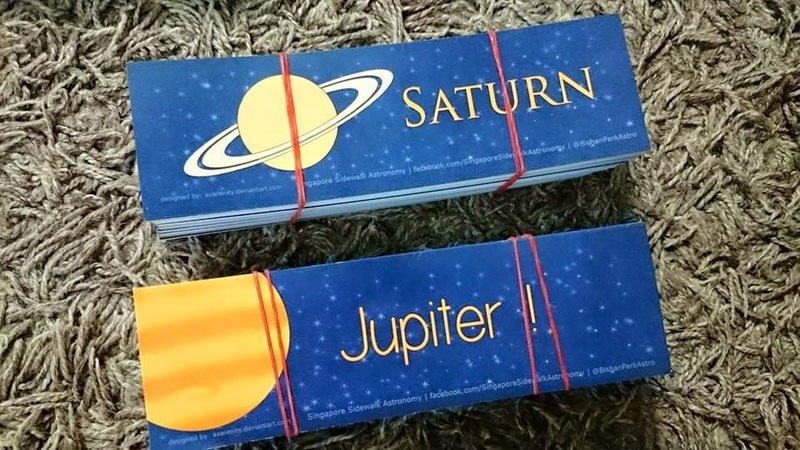 And also designing the beautiful bookmarks well-liked by audience of Toa Payoh Public Library talks as well as this lunar eclipse event. Keep drawing! Thanks to Haz for showcasing your unique solution to mobile phone projection and photography of Moon and planets. You are a born storyteller, conversationalist and entertainer. And that's why you excel in sidewalk astronomy and always draw a crowd around your telescope. Thanks to Desmond for helping out with your binoculars. Hope your first viewing of Total Lunar Eclipse was a pleasant experience and had fun doing lunar photography through binoculars. :) Your support in recent months in sidewalk astronomy is most appreciated. Thanks to Dave for the solar astronomy session and lunar eclipse photography. I guess some media over-hyped the "shortest lunar eclipse of the century" aspect. As a result, some may give up observing and taking photos too early. Happy you managed to snap some good shots. 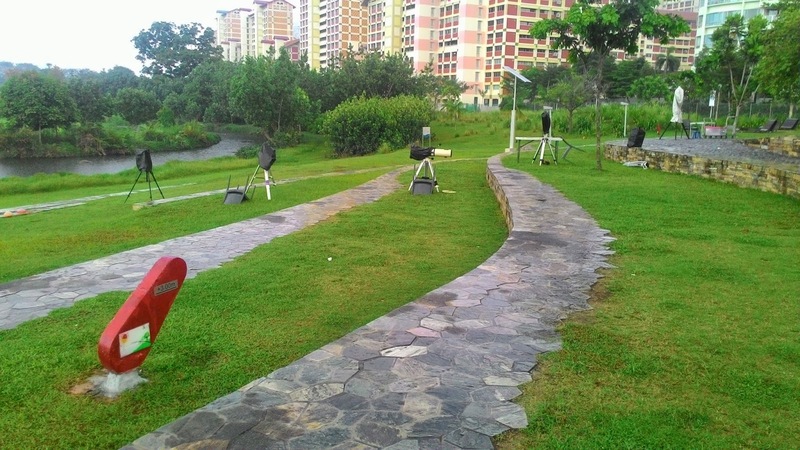 It has been almost 3 years to the month since we first met at Bishan Park at Grand Lawn I. Sidewalk astronomers come and go. You are one of the most dedicated amateur astronomers I have come across in recent years. Truly amazed by the astro momentum you have created at Bishan Park in just 3 short years. Let's keep the ball rolling! Thanks to James Chan from Mayflower Secondary School for helping me out. You are such a fine young man. Composed, well-behaved and friendly. Your parents & teachers must be very proud of you. Thanks for your support in the Toa Payoh Public Library talks. It has been a pleasure answering your questions after the talks. If not for your help last Saturday, I would not be able to take short breaks to reply phone calls and messages and taking short breaks to catch my breath. Feeling especially old that night as I walked up and down the huge steps. You most definitely deserve to own a telescope and join us as a sidewalk astronomer! iPhone cameras are incredibly fast and accurate in exposure. But for a budget smart phone, I am most impressed by the image quality by your Xiaomi Redmi 1s phone! Credit: James Chan. Cropped only. No further image edits. The following phone pic was shot with James' phone through James' telescope (sorry can't resist :)). Its exposure is slightly lowered in Photoshop to bring out more details at the expense of under-exposing the 3 moons. The 2 moons of Jupiter Io and Ganymede can be seen so close to each other. Europa is a very dim white dot at the upper left-hand corner. Thanks to Yuan Huan for helping out with his telescope. Seeing your long queue, it is proof yet again that there are still lots of people wanting to look through a telescope regardless of its size. Apologies if I missed out any volunteers and helpers. You all brought a smile to someone's face that evening. Happiness can be experienced with simple acts of kindness. 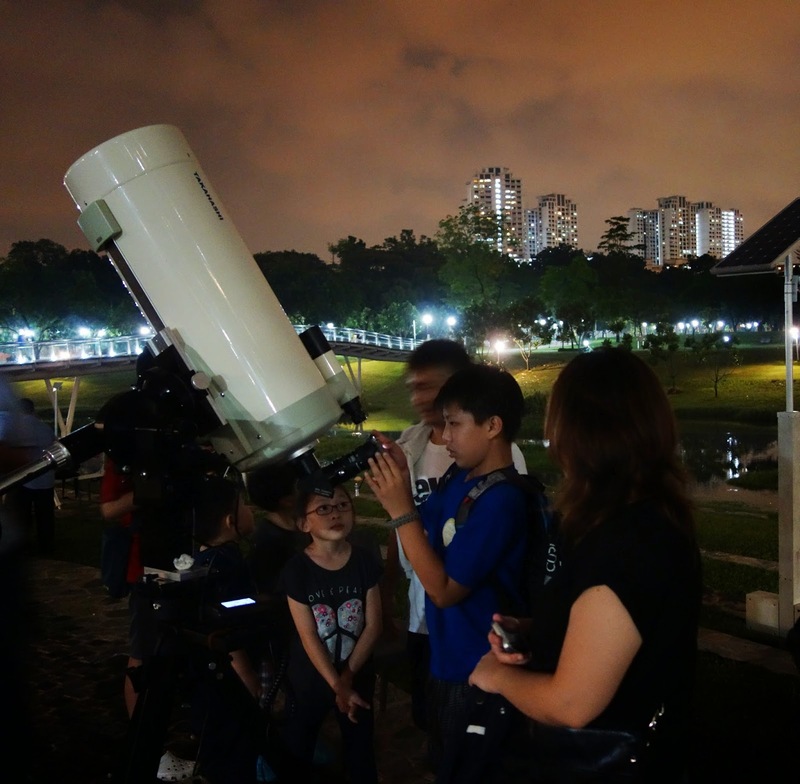 Thanks to Bishan Park McDonald's for loaning us spare chairs during this event and our regular stargazing sessions there over the years. You are the reason why we still have healthy backs to continue to conduct these sessions! Thank you The Straits Times and The New Paper for mentioning this Total Lunar Eclipse BEFORE it happened so that your readers have a chance to catch it and not to find out a day later that not only the missed it, they will have to wait till 2018 for the next one to be visible from Singapore. Last but not least, a big thank you to all who came for the event. Your presence which collectively creates an amazing live stargazing atmosphere is what makes watching an astronomical event much more exciting than just sitting in a room alone starring at a computer screen. The bonding among family, friends and strangers under the same sky is an incredible and unique feel-good experience. And to know that millions around the world are also observing the same eclipsed Moon at the same moment in time, sublime. Now get ready to experience the Lord of the Rings in the coming weeks! You won't believe your eyes! There's a Total Lunar Eclipse happening on Saturday, 4th April 2015. WEATHER PERMITTING, this eclipse is visible from Singapore on that evening from 7:07pm facing East. (1) Solar Astronomy from 3:30pm. Look at the Sun very safely with 100% certified filters and solar telescopes managed by experienced solar astronomers! WARNING: DO NOT look at the Sun directly, it will damage your eyesight! You may also observe the Sun very safely through solar paper viewers. Have a greater visual appreciation of this gigantic source of heat and light without which we will never see any eclipse on Earth or anywhere else in our Solar System! (2) Lunar Eclipse viewing from 7:00pm. Try to catch the Moon as early as possible when it rises at 7:07pm from the East (azimuth 95° to be precise). Missed it and you will have to wait until 2018 to see another Total Lunar Eclipse from Singapore. Take as many photos and videos of this eclipse as you can. Or just admire it with your eyes only, through telescopes or a pair of binoculars. Especially during the visually most exciting total eclipse phase from 7:57pm - 8:02pm (shortest in this 21st century). (3) Stargazing through telescopes from 7:45pm. We have been conducting free public stargazing sessions at this location since 2012. All events are free of charge and open to members of the public. As you can see from the above YouTube video, this location in Bishan Park has a good view of the Eastern horizon where the Moon rises. Should you find that location too crowded, you may also observe in other areas inside this big public park (which recently hosted a SG50 Concert attended by more than 8000 people). Good luck & hope to see plenty of your lunar eclipse photos and videos online on 4th April! 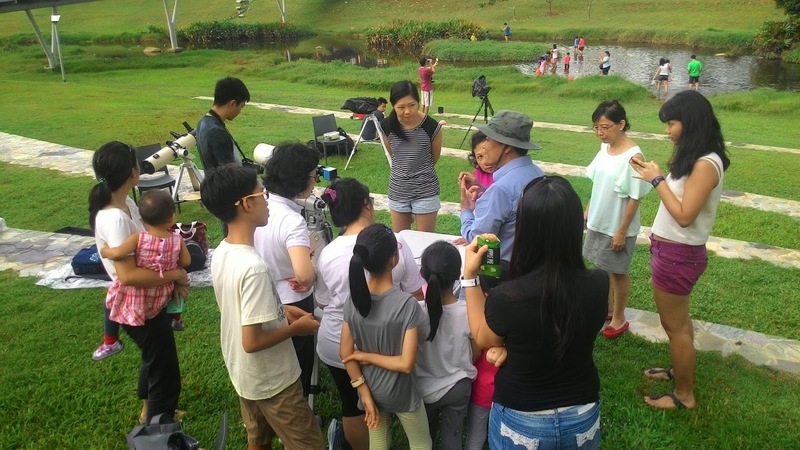 Weather permitting, there will be a free public stargazing session outside McDonald's at Bishan Park today 14 March 2015 from 7:45pm till late. Come join us to look at Jupiter, star cloud and star clusters through our telescopes! And if we are staying late after midnight, the amazing Saturn (with rings!) and breathtaking last quarter Moon! (1) Take train to Bishan MRT. (2) Cross the overhead bridge to the bus stop (opposite Junction 8 mall). (4) Alight at the second or third bus stop. (6) The park and McDonald's is just behind this condominium. Please take note there is free SG50 concert at the park just opposite McDonald's today. Featuring local singers Kit Chan and Oliver Ong. More information about this concert can be found in this Straits Times article. So for those who are driving, please take note of potential lack of parking space in the carpark inside Bishan Park. Please park nearby elsewhere or take public transport. So come join us with your family and friends and enjoy a great start to the school holidays! Follow my Twitter @astrosg for latest updates. The next public stargazing talk is titled "How to Choose a Telescope". There is a frequently asked question which is difficult to explain in a few words casually - how to choose a good telescope and where to buy it? (1) How to choose a telescope suitable for *you*. (2) How to avoid common (and expensive) pitfalls. (3) Pros and cons of buying telescope online and offline. Weather permitting, we will be conducting live stargazing during/after the talk at the open ground outside Toa Payoh Public Library. My friends and I will be deploying our telescopes for the public to enjoy. Come see Jupiter, Moon, star cloud and colourful stars like you have never seen it before! Interact with experienced and friendly amateur astronomers! Bring your family and friends along and join in the fun! The next public stargazing talk is titled "Jupiter, The King of the Planets". Are you still among the hundreds of thousands who still didn't know we can actual see planets from Earth? Even from a light-polluted city like Singapore, that is possible on a clear enough night. These planets may have been appearing on many nights outside your room window without you having the awareness to notice and identify them for what they are! 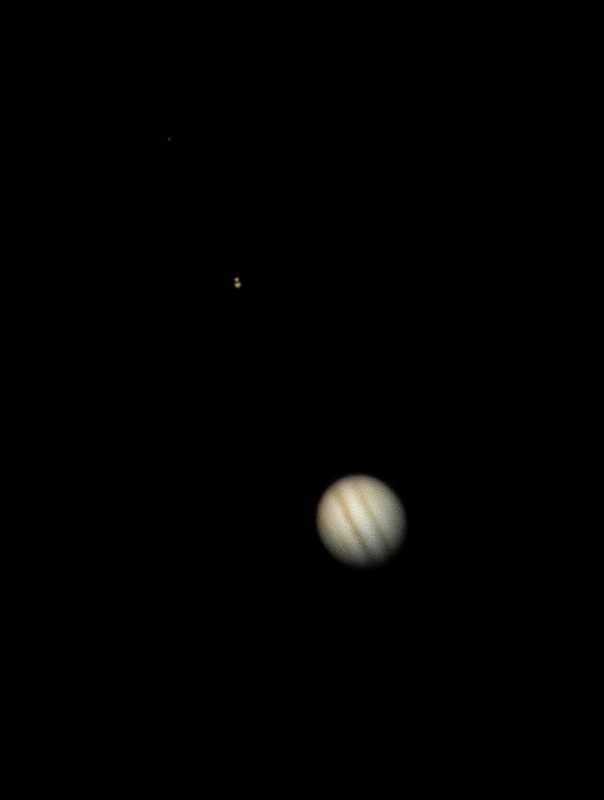 So let's start observing the planets starting with the biggest - Jupiter ... and its moons! Come attend this talk to learn how Jupiter looks like visually, its interesting features, how to locate it in the sky and the best practices in photographing it. Still need one more reason to see Jupiter? It is closest to Earth during this weekend in 2015! So bring your family and friends along and join in the fun! The next public stargazing talk is titled "Astronomical Events in 2015". There are several astronomical events happening this year - comet, meteor showers, eclipses, planetary close encounters, ... etc! Come attend this talk to see for yourselves how they look like, when and how to find them in the sky. Failure to plan ahead to see them is planning to fail! Weather permitting, we will be conducting live stargazing during/after the talk outside Courts Toa Payoh (instead of the open ground outside library due to the pasar malam there). My friends and I will be deploying our telescopes for the public to enjoy. So bring your family and friends along and join in the fun in the first weekend of 2015!